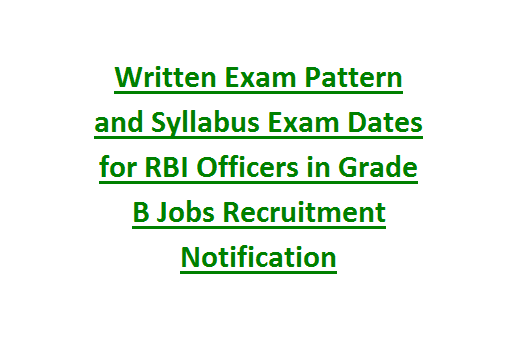 Written Exam Pattern and Syllabus Exam Dates for RBI Officers in Grade B Recruitment Notification 2017 Apply Online before 13/05/2017. Detailed information of Exam Pattern and Exam Syllabus for both Phase I and Phase II Online Written Examination Dated 17/06/2017 & 07/07/2017 are provided here in Govt Job Online. recruitment is 03/05/2017 to 13/05/2017. Reserve Bank of India RBI has two schemes of selections. One is Written Examination and the other is Interview. We are going to see in detail about the Written Exam, Pattern and Syllabus. The Written Examination be held in two Phases. For both phase Online mode only be available. 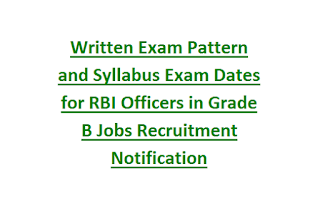 The RBI board have the ability to change the date of examination to some other days depends on the number of candidates. The Exam Date, Time and place will be mentioned in the Admission Letter (AL) which is to be downloaded by the candidate. The Phase I is scheduled on 17/06/2017.The subjects, marks question type and duration is mentioned in detail from the table below. RBI exam syllabus consists of 4 categories such as General Awareness, English Language, Quantitative Aptitude and Reasoning. 1. General Awareness: This topic includes General knowledge-Famous personalities-books-authors-animals-sanctuaries-dances-disasters etc; General studies-History-Geography-Computer Science-Sports-Politics-Economics and Current Events of National and International persons, places, authors, economy, sports, science & technology. 2. English Language: This topic includes Vocabulary-Synonyms-antonyms-spelling mistakes, Proficiency-Idioms & phrases-sentence and paragraph formation-substitution of sentence-rearrangement of words and sentence-fill in the blanks, English usage errors and English comprehensions. 3. Reasoning/Aptitude/Mental Ability: Questions asked from the topics are Reasoning Tests-Coding decoding-series-odd man out-directions-distance-linear & complex arrangements-data sufficiency & interpretations, Logic Tests-Syllogism-statement assumption-argument-conclusion-action, Non Verbal Tests-Visual ability & symmetry based problems-classification-series-analogy. 1. National Income & capita income, Poverty Alleviation & India Employment Generation, Sustainable Development & Environmental issues, GDP. 2. India Economic Reforms, Industrial & Labor Policy, Monetary and Fiscal Policy, Privatization, Economic Planning. 3. Globalization, Indian Economy, Balance of Payments, Export-Import Policy, International Economic Institutions, IMF and World Bank, WTO, Economic Cooperation. 5.Social Justice : Positive Discrimination in favor of the under privileged, Social Movements, Political System in India, Human Development, Social Sectors, Health and Education. English Syllabus shall be framed in an approach to evaluate the writing skills together with expression and understanding of the topic. (a) Financial System- Reserve Bank of India- functions and conduct of monetary policy, Banking System in India, Financial Institutions(EXIM, SIDBI, NHB, NABARD) & its regulators. (b) Financial Markets- functions, instruments, recent developments of Forex, Bond, Money, Equity, etc. The Management Processes Syllabus includes management of an Organization, Leadership skills and Communication process (Verbal versus non-verbal).